Montgomery, Ala. – May 29, 2018 - Local elected officials and business leaders joined with Alabama Governor Kay Ivey today to celebrate the announcement by Hyundai Motor Manufacturing Alabama LLC President and CEO Dong Ryeol Choi that Hyundai is investing $388 million to construct a plant dedicated to manufacturing engine heads and to enhance existing operations and support production of new models of Sonata and Elantra sedans. The investment will create 50 new jobs. Hyundai Motor Manufacturing Alabama (HMMA) is preparing for the next-generation Theta III engine, which requires new technologies and components as a part of its assembly process. The capital investment will be spent on equipment for the engine head machining plant and updating technology in an existing engine plant. 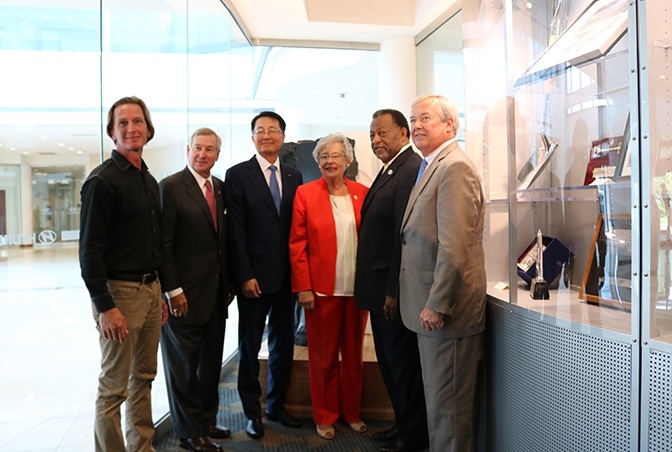 “Montgomery remains deeply committed to its partnership with Hyundai Motor Manufacturing Alabama and is honored to see its continued growth and expansion here in the River Region,” said Montgomery County Commission Chairman Elton Dean. “Together, Hyundai and Montgomery have created a blueprint for manufacturing success of which we are very proud. “Partnership and teamwork fuel economic growth, and we are grateful for partners like Hyundai Motor Manufacturing Alabama, whose long-term, expanding investment in this area drive significant impact on the region,” said Montgomery Mayor Todd Strange. It will cost approximately $40 million to construct the 260,000-square-foot building that will house the head machining equipment. Construction on the engine head machining plant is scheduled to be completed in November 2018. This project will free up space to expand engine assembly lines in one of HMMA’s existing engine plants. HMMA will begin producing the Theta III engine by mid-2019 for Sonata sedans and Santa Fe crossover utility vehicles. HMMA will continue to build the 2.0-liter Nu engine for Elantra sedans at its manufacturing facility in Montgomery. The engine plants produce approximately 700,000 engines per year to support the vehicle production at both HMMA and Kia Motors Manufacturing Georgia in West Point, Georgia. HMMA, which started vehicle production in May 2005, is the River Region’s largest private manufacturer with 2,700 full-time and 500 part-time employees. Editor’s Note: For high-resolution photos, click here. For more information, visit www.choosemontgomery.com. Hyundai Motor Manufacturing Alabama, headquartered in Montgomery, Ala., is an independent manufacturing operation of Hyundai Motor Company, based in Seoul, Korea. HMMA currently produces the 2018 Sonata and Elantra sedans and 2018 Santa Fe Sport CUV. Hyundai cars and sport utility vehicles are distributed throughout the United States by Hyundai Motor America and are sold and serviced by more than 900 Hyundai dealerships across North America. Montgomery, Alabama fosters a business-friendly environment and understands that a healthy mix of large and small businesses constitutes the lifeblood of the city and region. A long history of trusted public-private partnership between the city, county and local business leadership creates an inviting business ecosystem. Montgomery is built on a dynamic history rooted in revolution as the center of both the Civil War and the Civil Rights Movement. It is steeped in Southern tradition and hospitality, yet it is also a modern city on the forefront of cutting-edge development. It is attracting new businesses with its open internet exchange and opportunities for business growth, and new residents are coming for the city's livability, including a revitalization of the historic downtown along Dexter Avenue with new attractions and diverse entertainment options. For more information, visit www.choosemontgomery.com.